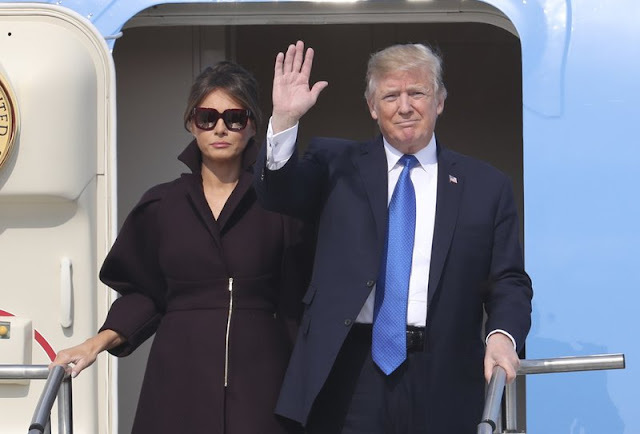 OSAN AIR BASE, South Korea (AP) — President Donald Trump arrived in South Korea on Tuesday, beginning a two-day visit centered on pressuring the nation’s neighbor to the north to abandon its nuclear weapons program. Trump landed at an air force base where he was greeted by dignitaries and a 21-cannon salute. He is then poised to travel to visit Camp Humphreys, a military base about 40 miles south of Seoul. U.S. and South Korean officials have said the base visit is meant to underscore the countries’ ties and South Korea’s commitment to contributing to its own defense. Burden-sharing is a theme Trump has stressed ever since his presidential campaign. But he will forgo the customary trip to the demilitarized zone separating north and south — a pilgrimage made by every U.S. presidents except one since Ronald Reagan as a demonstration of solidarity with the South. A senior administration recently dubbed the border trip as “a bit of a cliche” and several other members of the administration, including Vice President Mike Pence, have visited the DMZ this year. And the White House believes that Trump has already made his support of South Korea crystal clear. Trump and South Korea’s liberal President Moon Jae-in agree on the need to pressure the North with sanctions and other deterrence measures. But Trump has warned of unleashing “fire and fury,” threatened to “totally destroy” the North, if necessary, and repeatedly insisted that all options are on the table. Moon, meanwhile, favors dialogue as the best strategy for defusing the nuclear tension and vehemently opposes a potential military clash that could cause enormous casualties in South Korea. Trump will spend Tuesday in meetings with Moon, hold a joint press conference and be feted at a state dinner. 0 Response to "Trump lands in South Korea to pressure the North"